I ride. Born and raised on a ranch in Saskatchewan,I rode at a very early age. 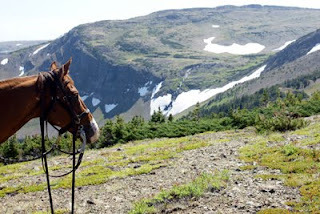 I have three grown children and five grandchildren but today I live alone with my horses and dog on a small acreage in the Olds area of Alberta... and I ride. 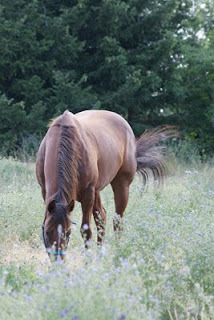 Horses, riding and reining and working cowhorse are my passion. A round oak table stands in the center of my kitchen/dining room. The table has been with me many years - my children sat around it every morning before they dashed out the door to meet the school bus; they ate there with me again in the evening; lively birthday parties and holiday dinners happened around that table. The finish on the top is wearing through in places and it has developed a squeak but still, every day, I use that table. Some days, like today, I remember where it came from. When my husband, children and I lived in northern Saskatchewan on the Crooked River Community Pasture, my husband brought mail to an elderly gentleman who lived in the bush about two kilometers from our house. We called him " a hermit" and indeed he was. Frank Miklos never left his property. Once a month, my husband brought his mail to him and returned with the signed pension cheque and a list. Garry shopped for Frank and brought supplies back to him along with whatever money was left over. In the summer, Garry drove but, since no real road existed to Frank's place, in the winter he packed groceries, etc in on horseback. Almost always, Frank offered Garry a glass on his raspberry wine. Frank made good raspberry wine . . . and lots of it - 45 gallons every year from the rather large patch of berries he grew. I don't think he grew much else in his garden, but he tended those raspberries well and the bushes rewarded him with an ample crop every year - more than he needed for his wine. So he asked if I would like to pick some. Would I!! I, too, was invited in Frank's house for raspberry wine. That's when I saw the table. Under a small, smudged window, a soot-blackened round oak table accompanied by equally blackened chairs and sideboard rested in peaceful obscurity. I loved the table, the whole set, and tried to buy it from him. "You never can tell what I might do," he said, but he would not sell it. I gave up asking. This was the pattern for two or three years until one winter, when Garry rode to Frank's for his monthly visit, he found him in a terrible state - very sick and weak. Garry quickly rode home, called friends with skidoos and an ambulance. Frank was admitted to the hospital. Meanwhile, we worried about his property, now left unattended. Moreover, we knew there was cash in his house somewhere because Garry had been returning what was left of his pension cheque every month. We decided we should find it and bank it for him for he would be needing it. When I visited Frank in the hospital, he told me to take the table, chairs and sideboard, but I didn't. "You might need those," I said. Frank did not come home. He died in Saskatoon hospital a few months later. In truth, I wonder how much of a favour we did him by rescuing him for he was lost and a little frightened away from his "little heaven". He had one relative in Canada, a nephew in Calgary. When his nephew came to Crooked River, he visited with us. "Uncle Frank told me that his round oak table, chairs and sideboard is yours,"he said. Nope - I didn't know what Frank might do, but he did. I refinished the set and it was beautiful. I still have it today. I reminds me of a Hungarian hermit and raspberry wine. 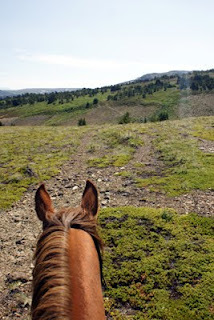 Last Monday I loaded Whisper in the trailer and headed out for a one-day trail ride. Desperate for at least one ride in the mountains before summer was over and sure that cooler weather was on its way, I ignored all the work at home to go. 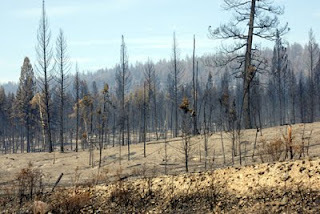 I also did a really good job of "forgetting" about forest fires raging only a few miles from me. In fact, that was one of the reasons I wanted to go - to get above the thick smoke that blandeted my property. I hoped, if I rode to 6000-7000 feet that I would enjoy clear air. On my way to Tatlayoko Lake, I drove through reminders of the devastation a wildfire can leave behind. The smoke thinned as I travelled and my spirits lifted. When I reached the lake, only a haze lingered over the mountains. I unloaded Whisper, hobbled her to graze, made myself something to eat, then started to organize for the ride the next morning. I checked my backpack for survival items, leaving lots of room for camera equipment and tied the saddlebags on the saddle. By then, Whisper had eaten her fill, so I walked her to the lake for a drink (wasted effort because she wasn't interested). I led her back to the outfit and tied her to a tree for the night. I wondered if she would fuss since I had pulled her out of the herd to take on this ride, but she seemed content, almost happy to be alone with me... 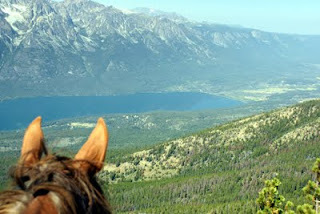 The next morning, I quickly packed up to head up the trail to Potato Range, high above Tatlayoko Lake. I had been there before so I knew how to access the trail to the top, a distance of about 10 km - all uphill! 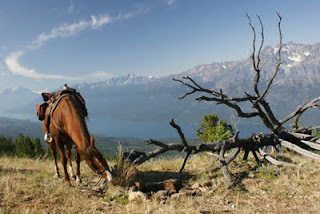 When the trail opened up for a view of the lake, I got off Whisper to give her a break and take some photos. What a view! 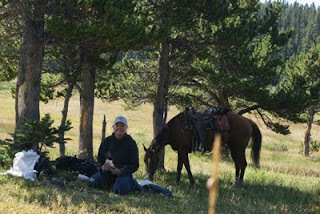 Finally, we reached the open meadows of Potato Range and here I had my sandwich and coffee. (Photo taken on the timer - camera perched on an old log.) A deep peace settled over me. 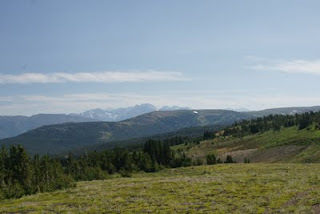 Such a vast land - acres and acres of wilderness - and not another person for miles and miles! I headed down the Potato Trail, through trees uphill, along an open side hill, lost in my own thoughts. I wanted to explore the Crest Route more, so when I spotted an access, I left the trail to climb to the crest and a spectacular view. I dismounted and sat a spell by Whisper, who like I, seemed fascinated by what she could see. After more pictures and a little video, I headed Whisper down to the trail again, but before too long, I detoured to the top again, this time weaving around snowbanks. 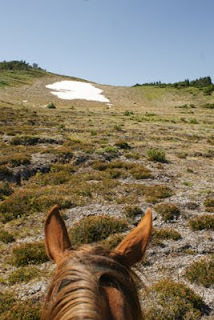 Horseflies were our constant companions and, when we reached the top, a stiff breeze cooled us. The weather was almost perfect for this ride - about 20 degrees, a good ten degrees cooler than it would be at the bottom! I looked at the altitude reading on my GPS - almost 7000 feet! Whisper was starting to tire. I knew I must turn around soon although I wanted to go farther. Reluctantly, I turned back. Three hours later, after a long, long descent, Whisper and I arrived at the trailer, our home for the night. 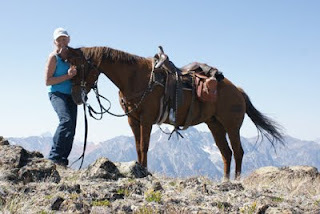 As I always do after a trail ride, I wished I was back up on top! The next morning, I leisurely prepared for the drive home. At Tatla Lake, I stopped at a wonderful little store. "You in Potato Range?" a patron asked. "Yes. Just on the way home." "If you can get home!" he said, and that is how I learned that the highway was closed from west of Alexis Creek to Lee's Corner, exactly where I live! Now I was alarmed! "What a fool!" I thought. "You left home when wildfires were raging! What were you thinking!" Frantically, I tried to call the girl doing my chores and my neighbours to find out what was going on, but no answer... I started driving. The 120 km home was a little stressful, not knowing what I would find when I got there. I had visions of my friends moving my horses, or maybe even the house burning. As I approached Alexis Creek, smoke engulfed me. The highway was closed all right, but I talked my way through to go home and, I am happy to report, my house was still standing. The fire, although a real threat, was still a distance from my property. "How happy are you about that?" my friend asked me as I stepped off of Walking With Wolves (aka Little Wolf) after the NRHA approved three-year-old Futurity at Prince George Fall Slide. It was a rhetorical question. She knew I was happy because she knew what I expected of him, but she may not have guessed how emotional I was as well. As I backed Little Wolf up, the last maneuver of reining pattern #5, I had leaned forward, wrapped my arms around his neck and hugged him. I had felt tears welling up - this three-year-old, this playful, mischievous, not-always-fun-to-ride stallion, had just given me 100% of his attention for the past five minutes. He was "with me" every step of the way - he waited when I wanted to wait, he loped into clean lead departures when I asked, he circled, he changed leads, he spun and he stopped - exactly when I asked. My heart had swelled when I ran down for the last stop. My Little Wolf, my 'let's see what I can get away with', immature colt, had executed a really pretty reining pattern just because (no other reason) I asked him to! It's no secret I love my horses, but Little Wolf was a little harder to love than most. He is a stallion, which makes disciplining mandatory, and he tested me - every day. After months of training and coping with his pranks, I finally figured out he likes to test me. He's smart, almost too smart, and he tests me just to see if I am paying attention. He pulls blankets off of racks when I walk him through the barn; he reaches around and grabs the end of the rein in his mouth if I stand in the arena teaching off of him; he unseated three times when he was two by laying down to roll (the first time he just forgot I was on him and rolling in the snow seemed like a good idea. After that he thought it was fun to lose me.) For many months, Little Wolf was not fun to ride because I never knew what he would do next ( Thank goodness he didn't learn bucking worked!) . . . and I never had anywhere near all of his attention! One day, though, well into his three-year-old year, I realized I loved this animal - in spite of, and maybe because of, his quirky personality. And that is why I almost cried at the end of my run on Little Wolf at Prince George. My pretty bay stallion did not win anything that day, but he gave me exactly the run I asked him for. How happy was I about that? I was thrilled!